Rabada put a finger to his lips and watched Feeds stroll past him on his way back to the structure at Lord's. Rabada's response came after he was restricted for the second test between the nations, at Trent Extension beginning Friday, for swearing at Stirs in the wake of rejecting the allrounder on Thursday in the primary innings. The verbal mishandle was gotten over the stump receivers. Rabada was given a one-coordinate boycott on account of a gathering of fault focuses inside a two-year time frame, having as of now been on three focuses following a conflict with Sri Lanka opener Niroshan Dickwella amid an ODI in February. Proteas batsman Temba Bavuma said Saturday that the 22-year-old Rabada, a standout amongst the most energizing youthful bowlers in the game, was "grief stricken" at disappointing his partners. South Africa's players have bolstered Rabada, and mobbed him subsequent to expelling Feeds on Sunday. 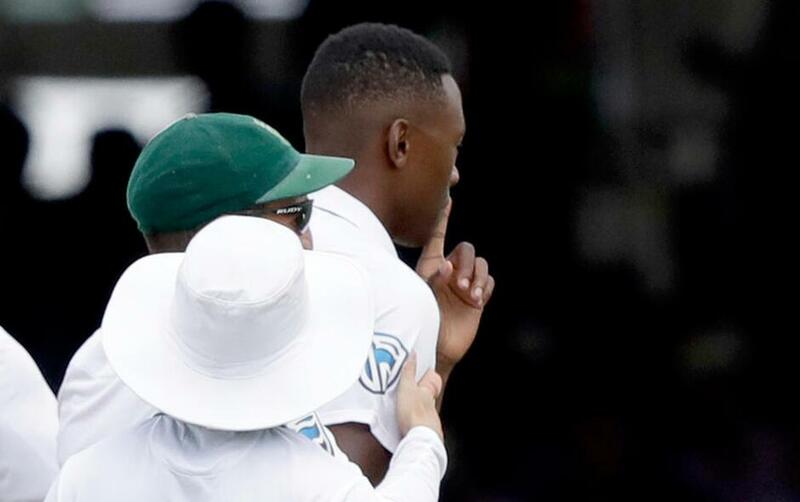 Wicketkeeper Quinton de Kock even put his hand over Rabada's mouth.